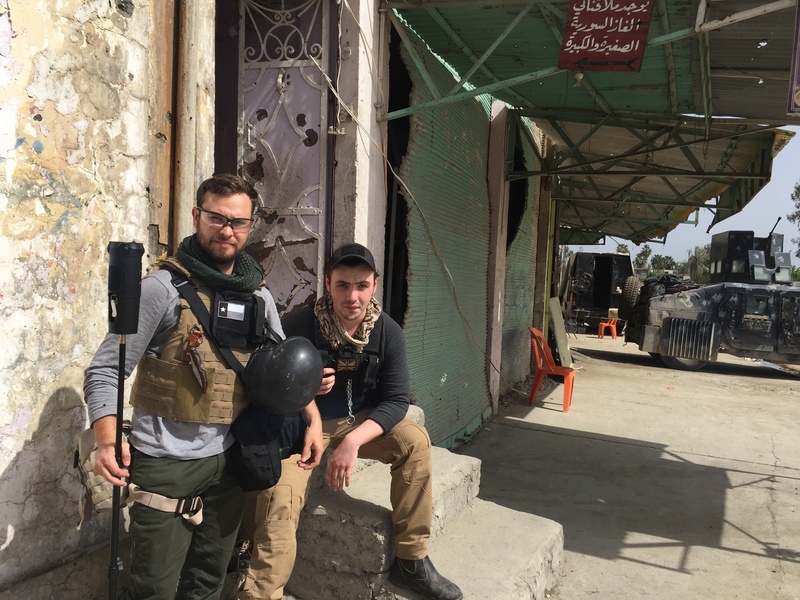 Freelance Society Co-Founder Dylan Roberts has been producing VR content since 2015. His clients for VR (and flattiesSlang for traditional, 2-D videos.) range from Ryot and The Economist to The New York Times, among others. The Sun Ladies VR, for which Dylan acted as executive producer, has just been selected for 2018 Sundance Film Festival’s New Frontier: The Crossroads of Film, Art and Technology. 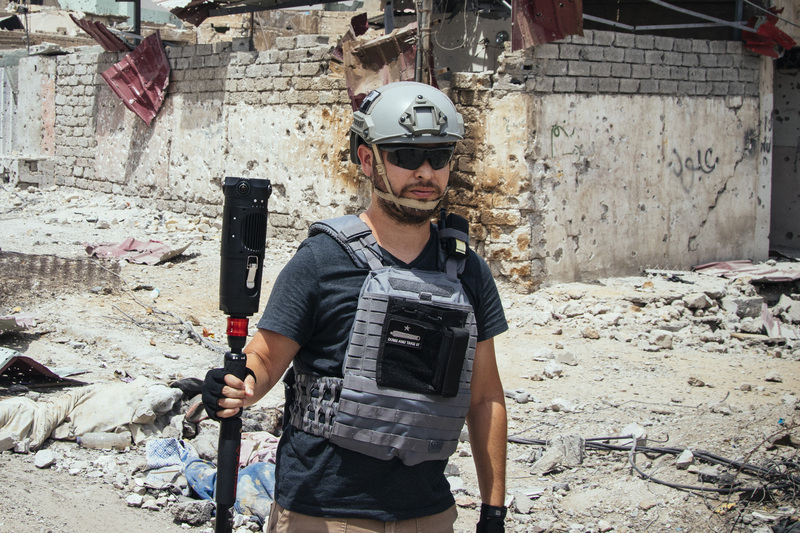 I had the chance to chat with Dylan about keeping equipment safe in tough situations, his top camera picks, how freelance journalists should approach VR content and get a behind-the-scenes look at The Sun Ladies VR. How did you initially get into 360? My co-founder, Christian Stephen, and I were working with Ryot in 2015, helping to expand their global news platform. We had contacts in the Middle East and Africa and Ryot asked us to get some content for them and they gave us Freedom 360 rigs. Over the next 6 months, we did about 16 pieces of content for them, about half of that in 360. We taught ourselves how to stitch and edit, learned the different cameras, and just filmed and learned. The main film everyone knows is Welcome to Aleppo, filmed and directed by Christian, and that was the first VR film shot in a war zone. 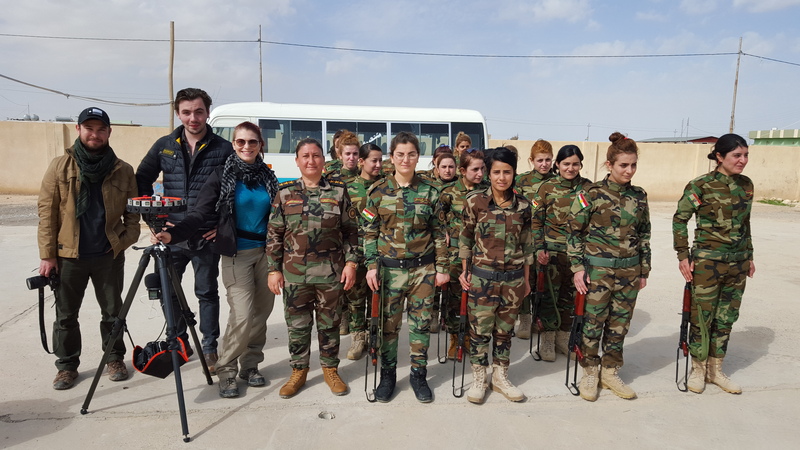 Then we did more VR in Iraq on a safehouse for women in Erbil and the refugee crisis in Europe. But, we still do a lot of traditional documentary. We probably do half and half, but they go hand in hand. If we do a flat project, we also do a 360 project to share that story in a different medium if the story makes sense for VR. And we’ll probably keep it 50-50 because we still love traditional documentary storytelling. How do you decide when you’re going to do a flattie versus 360? If we need to do a longer format with a stronger narrative, we’ll go 2D. But we’ll do a VR project if we can focus on one subject or scene. If we’re doing both, we’ll try to tell a more narrow part of the overall story in VR, just the best scenes or subjects. What do you most love about VR versus doc? With 360, you get what you get and it’s hard to fabricate more. I think that’s really important in today’s journalism world. For example, even when the western front of Mosul was active, the east side was going back to normal. People shooting traditional news would say they were on the front lines when they were really just standing in front of the only blown out building on the blockPosition and choreograph actor movements in a scene. and the videographer cropped out all the civilians walking around the street. 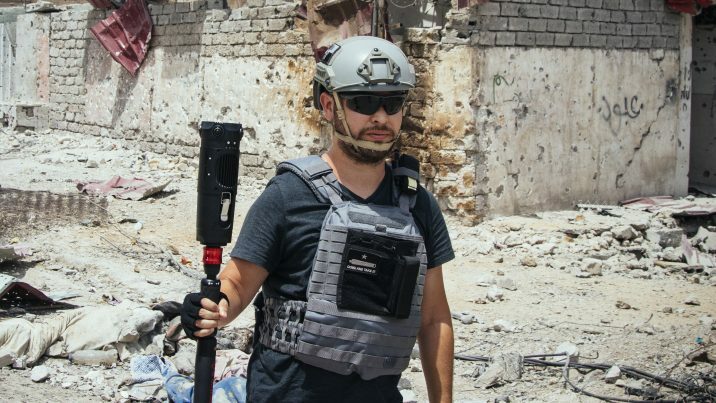 That’s why I like VR in conflict zones. It shows everything. I’m also excited that it gives freelance journalists another way to make a living. 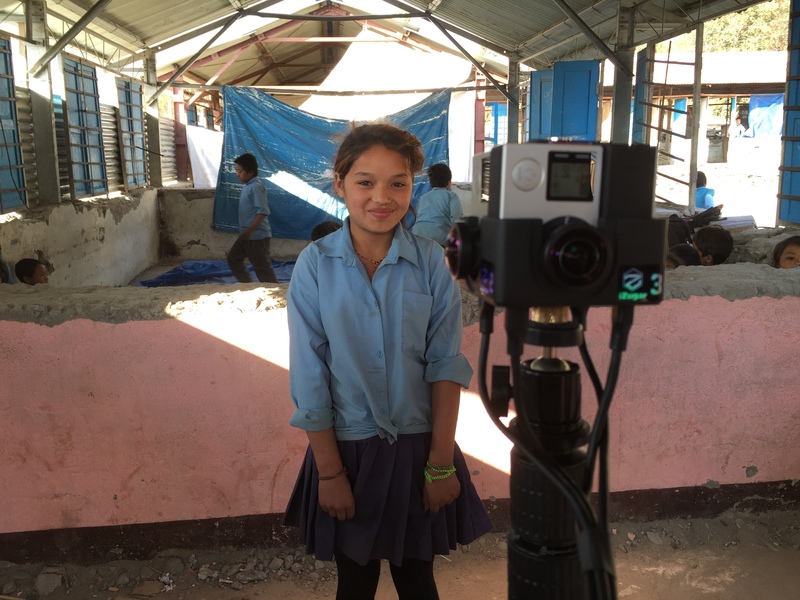 So far, not many journalists are getting VR projects. They’re going to the big players instead. It’s hard for freelancers to pitch those stories because they don’t have the equipment and they’ll need to takeIndividual instance of a shot; a take = each time the camera is started and stopped. the time to know the technology really well. I’m not saying Jaunt or Google or Ryot can’t do journalistic work, but for VR journalism to really thrive it has to reach the freelance community. They have the knowledge and the contact and the tory ideas. They just have to be willing to hold onto their great stories, takeIndividual instance of a shot; a take = each time the camera is started and stopped. the time to pitch them and line up those budgets, instead of doing it really quickly to just get paid. When it comes to VR journalism, one of the chief concerns I’ve heard is that 360 might need a more strict set of ethics than flat media. What do you think about it? We’ve always used the same rules as traditional video. I just think 360 makes it harder for journalists to overhype the situation even if it’s more challenging for them to tell a good story in 360. We have captured a lot of footage where people are experiencing a lot of pain that we haven’t published yet. But, we’re thinking of using some of it in this VR documentary we’re working on now. But, we’re worried how it might affect the viewers. You’re getting the full sight and audio. You’re really only missing the smell. To be honest, I haven’t figured it out just yet. The journalistA description for the word journalist that goes on and on a bit that goes on and on a bit that goes on and on a bit. in me wants to show the reality, but the human in me is wondering if I need to show that to get the point across. Obviously war is bad and people die from it, so do I need to show the craziness of it or can I show a blown out building and talk about what happened there? I tend to lean towards showing it. People are people and they’ll deal with it…it just depends on what you think they can deal with. I’m curious to see more data behind VR. We see so much graphic content already that we’ve become numb to on the internet, but with VR you’re immersed in it. You find yourself in a lot of tough situations and have a lot of unique needs in a camera. What camera(s) do you use? When we were using the Freedom 360 rigs, it was really tough. We had wires all around, we were duct taping batteries and dodging bullets while we’re spinning our cameras around and clapping to sync the cameras. One time, we were getting hit by live fire and one of our GoPros wasn’t turning on, so right there, I had to get the screwdriver out, remove the camera and reformat the card. Then we started using the Samsung Gear 360, which was pretty great, and then we started using the Z Cam S1, which has become one of my favorite cameras. We use the Omni, too. 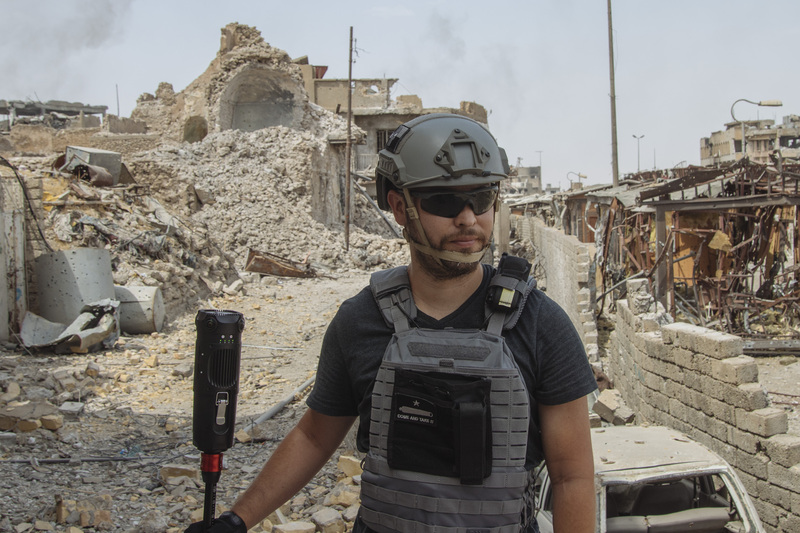 I also shot a lot of stuff during Hurricane Harvey in Houston using the Garmin Virb 360, which is a great camera for journalists getting into it. It’s naturally shot flat, but you can get creative on the post production side, and the picture quality is really good. And it’s pretty indestructible. Overall, we’ve been really lucky. Part of that is the setting. On traditional sets, you can get out of the shot. We’ve done stuff like that, like a piece on Nepal after the earthquake, where the scenes were pretty controlled. 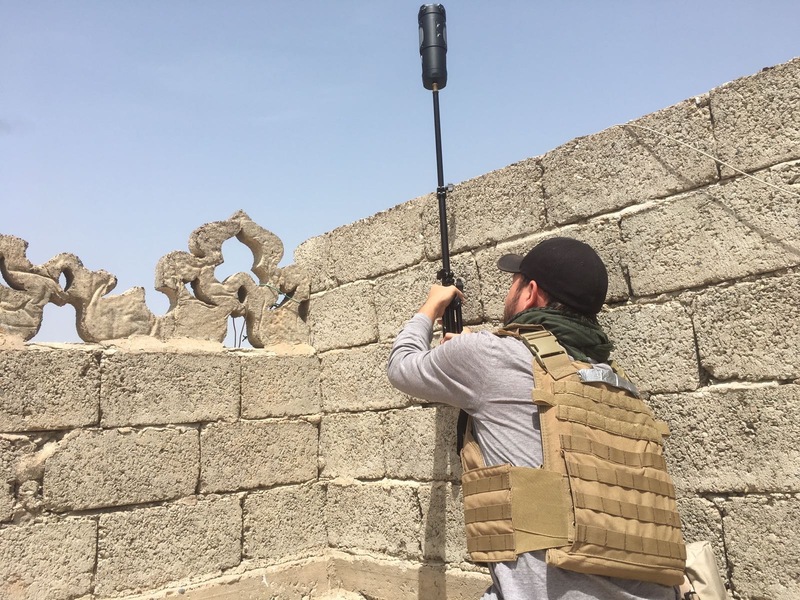 But in a conflict zone, we’re always close to the camera and watching it, so if something were about to happen, we’d be there to grab the camera. I’ll know if a soldier is about to bump it or there’s going to be an air strike. If I were hiding away, I wouldn’t see those things coming. With the way we usually film, whatever happens to the camera happens to me. I did have my Z Cam break in Mosul when tank blast hit right next to it. It was on a good monopod, but it just fell right over. Thankfully, Z Cam was able to fix it for me. They replaced three lenses and the clamps attaching the camera to the battery pack for about $100 per lens. And, Radiant Images sent me their Z Cam to use while I didn’t have one! Now I use the [iFootage] Cobra 2 Strike monopod. Before I bought the Strike, I was using a light stand, which was light and great, but it was harder to adjust and in those tense moments, you want something sturdy and fast to use. Any other gear you recommend? We’ve used a lot of different audio solutions, from the Zoom H4N to the Rode VideoMic Me for iPhone. We do our interviews separate on the Zoom H1N, and we use the H2N for natural sound if we aren’t using the camera’s audio. 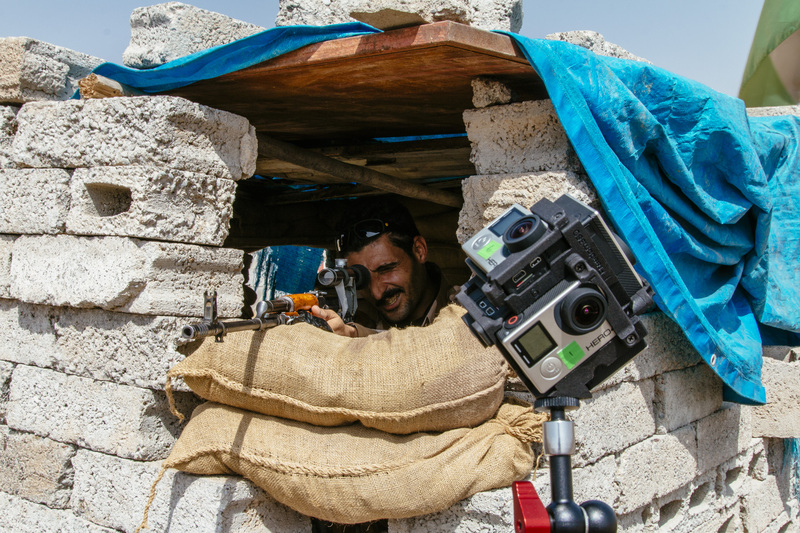 The camera’s audio is usually what we do in conflict zones. On those shoots, we usually only have one person and there’s only so much you can focus on. The Omni’s audio isn’t bad, but the Z Cam is a bit on the quiet side. I’d love for them to add an audio jack because I hate syncing audio. In fact, I’d love if there were polls on what to add to various cameras. One thing I’d love to see is more 360/VR camera bags. I haven’t seen any, so I modify existing bags. For DSLRs, there are lots of bags and straps to make it easy to pull your camera out quickly. For 360 cameras, you pretty much have to set everything up and hope you don’t need to change anything. But, it’s hard to make a bag or strap for those cameras because they’re so many different shapes and sizes and the strap would show. I’d most like to see something for the Z Cam. We just did the film The Sun Ladies VR with Celine Tricart and actress Maria Bello, Christian Stephen (my business partner) and Kate Brooks. Celine is one of my favorite DPs. We used the Odyssey GoPro rig for that. I don’t know how she did it, but she handled that camera like a champ. It was great to work with a team on that one, because doing solo VR projects can be pretty crazy. We’ll also be working on a longer 360 documentary with footage we’ve shot over the years. We decided to do the film from the perspective of what journalists go through to get the story. We think it’ll be 15 or 20 minutes. We’re being very patient with it and do it right. I’m also doing more corporate VR and overall awareness, being one of the only VR guys in the south. I live in Austin, Texas, and I went to school at the University of Arkansas and my wife is from Tulsa, Oklahoma, so we have a house there as well. I also run the VR program for Tulsa’s Overground Film & Music Festival and did a VR room at the Hot Springs Documentary Film Festival. I’m doing more education and awareness in the region to let people try VR for the first time. A lot of people put on the headset and say they want to go on a roller coaster. They don’t realize these are actual films.